· The owner Mike is available for private diving instruction or courses if booked in advance (fully qualified diving instructor). Jackie and Mike built the beautiful Caladonia bed and breakfast just 4 years ago. 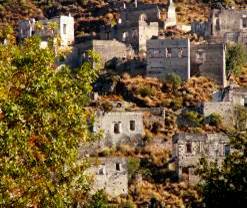 Set in farmland towards the back of the Kayakoy valley, Caladonia offers a peaceful escape. The property has just three private, air conditioned rooms all decorated to a high standard with en-suite facilities. Mike is a fully qualified diving instructor and has built a large deep pool where visitors can learn scuba diving basics or simply relax and take a dip. The grounds of Caladonia are pretty with a nice sunbathing terrace looking out towards Babadag mountain and the ruins of the ghost town in the distance. WALKING TOURS & ACTIVITIES: Mike is a fully qualified diving instructor and can take experienced divers or those wishing to learn for private dives or instruction on request. Please email us in advance if you wish to take up this option. Walking is also a great pastime and Caladonias location is ideal for those wishing to explore on foot. Guided tours are available as are group treks, please email us in advance for dates and prices. PRICES QUOTED ARE FOR ON A BED & BREAKFAST BASIS PER PERSON PER NIGHT. 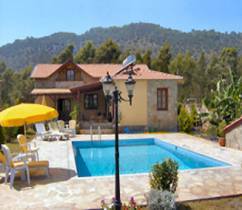 LOCATION: 15 minutes drive from Gemiler Beach, Olu Deniz, Hisaronu & Fethiye. A dolmus (local bus) service is available hourly from central Kayakoy. Free transfers can be arranged to many of the local restaurants and bars. CAR HIRE: Advised for those that wish to explore further a field. Caladonia is in a fairly remote area of Kayakoy.